emmatree: advent evening 10: christmas past and christmas found. advent evening 10: christmas past and christmas found. her christmas card to my mother many years ago. i am now in bed, toes snuggled warm beneath a comforter, heater churning out heat, silence caressing my shoulders, snuggling against me, welcoming me home. an early movie tonight, harry potter and company helping us put to rest this rushed crazy week, and then we were off, the ever-wonderful michael headed down the highway, i moving towards home, driving the back streets, not quite sure where I was, but knowing the direction; not knowing, however, that i was about to wander into christmas past until it was too late and i had already done so. the dark streets, the wrong side of town where houses are still small, these houses that, in my childhood, were not the wrong side of town, just the poorer side ~ still just the poorer side deemed the wrong side ~ but nevermind because there i was, in the darkness of the streets surrounded by tiny houses and imperfect christmas decorations and suddenly i was home again, a child again. how lucky to have been a child then, when only a few people we knew were able to afford christmas lights on the outside, how lucky that those lights were just a few strings of color here and there across a window, outlining a door. how lucky to have found such magic in those tiny pieces of enchanted imperfection and how lucky to have found it again. how fabulously lucky. i drove tonight's tiny narrow streets, and remembered it all, heard the soft pitter-patter of reindeer on the roof, listened to my father’s explanation that one needn’t have a fireplace, that santa was magical and knew where we lived. remembered walking the neighborhood streets in the darkness and glow of what lights there were, drinking in the almost-here-ness of christmas, remembered the angel wings i wore in a church play. remembered it all. felt my bones recall it all, my soul, my heart. i drove those backstreet wrong side of town streets and listened to i’m dreaming of a white christmas and winter wonderland and breathed, exhaled this hard week, out with the bad, and inhaled the crookedly strung shimmers of red and green and blue, in with the good. christmas. found. and so, for you and yours, i wish you ribbons that don't perfectly perfectly match the paper, i wish you some darkness still visible through all the lights, i wish you a tree that that wiggles and giggles and jingles a bell or two. i wish you mistakes and laughter and silliness and silent night. i also wish you a song to which you forget some of the words. i saw harry potter last week after my crazy week. this was beautiful writing that captures the essence of memories. it IS a season to remember how lucky we are. 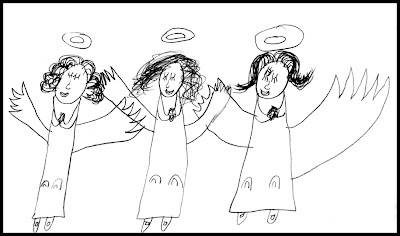 and those church-play angel wings? you're still wearin' them. There's such beauty in the inperfection and lights hung crooked or not are always beautifully magic. Ahh, I'm there, too, driving past my little growing up house. We couldn't afford lights, but daddy always cut a little cedar tree for us to hang our handmade ornaments on. We had a few lights on our tree and it was enough to make the magic happen! Nice post!!! Yes, this is the Christmas of my past also, when Santa handed me a an orange and a candy cane and I was thrilled beyond belief. Where the basic songs sang in my heart of Joy to the World. Blessings to you this Christmas and though it might not be perfect it still sings to you. Those are the sweetest angels I've seen (next to the one my son did when he was 3 1/2 yrs old). If I was your mom, that card would still make me cry with pride, joy and love. i am happy to be a part of your memories in this post .. and am also always somewhat comforted by life's "backstreets"
oh my god, this is incredible. all the wonder of christmas--literally all of it--is in these words. fabulously lucky indeed, and so is anyone who reads this. This post makes me think back to a conversation I was having with a friend last week. We were looking at all the lights and I was telling her that I am having the hardest time connecting these LED lights to Christmas. Everything I connect with this time of year has some link to my childhood...and LED's were not in my childhood. They are too much the wrong kind of colour..or something. I remember a night when I was little....my dad had the outdoor lights strung out on the living room floor, to see if they were all working before he put them up outside. And I will never forget how vivid those colours looked to my young eyes. I was completely mesmerized. That was the first spell Christmas cast over me. So, to this day, I go looking for the houses that have the more traditional lights on them....to help me connect to my own version of Christmas.